Now in its 24th season, the Greater New Orleans Youth Orchestras (GNOYO) has filled a need in the city for high-quality orchestral experiences for school-age musicians. 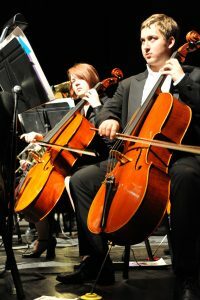 Begun in 1994 by a group of parents, interested Louisiana Philharmonic Orchestra musicians and local music teachers, it offered membership by audition in its Sinfonia, an intermediate level string orchestra, and Philharmonia, a full orchestra for more advanced students on all orchestral instruments. The first performances in May 1995 were conducted by Carrie Telthorst at the University of New Orleans Performing Arts Center. The following season John Fairlie was appointed Conductor of the Philharmonia and Marta Jurjevich the Assistant Conductor as well as Conductor of the Sinfonia. In the fall of 1995, GNOYO became the “official youth orchestra” of the Louisiana Philharmonic Orchestra, accepted 75 students for its second season and hosted and performed a joint concert with the Midwest Young Artists Senior Orchestra from Chicago. Having initially operated under the financial umbrella of the Greater New Orleans Suzuki Forum, GNOYO legally incorporated on February 26, 1996 as an independent non-profit arts organization in the State of Louisiana, achieved tax-exempt status as a 501(c) 3 organization and elected a board of directors. That year John Fairlie became its first Executive Director. The 1996 season saw GNOYO grow to one hundred participants, drawing students from as far away as Cut Off and Houma, Louisiana and Biloxi, Mississippi. Subsequent seasons included side-by-side performances with the Louisiana Philharmonic Orchestra as part of the LPO’s Young Peoples’ Concerts Series and inclusion of GNOYO’s Instrument/Scholarship Program, an ambitious outreach program for aspiring young musicians of need. In March 1998 GNOYO collaborated with the New Orleans Ballet in a production of “Peter & the Wolf”. In 1999 GNOYO’s Northshore Sinfonia began rehearsing in Covington under the direction of Kent Jensen and the Summer Festival celebrated its first season at the New Orleans Science and Math High School. In the fall of that year a new advanced full orchestra, the “GNOYO Symphony”, was added to the ensembles rehearsing in New Orleans and in January all New Orleans-based orchestras began rehearsing in the new NOCCA|Riverfront as an adjunct component of their Saturday classes. The Northshore Philharmonia and a new chamber music program began rehearsing in September 2002. In Spring of 2005, GNOYO once again collaborated with a local nonprofit, this time the Jefferson Performing Arts Society Youth Chorus. By the end of the 2004-2005 season, GNOYO was experiencing record participation, serving over 250 young people and performing to standing room only audiences. In August 2005, Hurricane Katrina drastically changed the lives of GNOYO’s participants. Realizing how necessary its programs were to the recovery of the community, GNOYO resumed activities in October providing a routine and stable creative outlet for the young people of the Gulf Coast. As families returned to the area enrollment grew slowly but steadily. A musical highlight of that first recovery season was the debut of Michael Rihner’s composition “New Orleans Suite” depicting musical pictures of New Orleans favorites – the streetcar, the bayou, and a second line parade. To recognize GNOYO’s relevance post-Katrina, GNOYO was the 2006 recipient of the Governor’s Arts Award in the Arts Organization/Education Category and 1 of 13 winners in the 2006 Coming Up Taller Awards presented by the President’s Committee for the Arts and Humanities. Music Director, Dr Jean Montès, brought his musical vision to GNOYO as well as a collaboration with Loyola School of Fine Arts in 2007 and has added a Young Artist Academy and enhanced chamber music opportunities to GNOYO’s programs. The Symphony, under the direction of Dr. Montès, performed in New York’s Carnegie Hall in June of 2009. Dr. Montès continues to lead GNOYO in exciting opportunities including an event in which the entire GNOYO orchestra performed with world-famous violinist, Midori, at the Mahalia Jackson Theater on January 10, 2010. Also in the same year Dr. Montes added the SRCNOLA programs which is designed to give intensive sight reading lessons to 10 local high schools in the area, and the Explore Louisiana Program designed to bring orchestral performances across Louisiana. In 2010 GNOYO, in response to the Earthquake in Hati, raised money and collected instruments to help young musicians who lost everything. Dr. Montes still makes regular trips to distribute the instruments, and works with music programs throughout the country. In 2011 GNOYO made it’s first international appearance when Dr. Montes took the GNOYO Symphony on a five-concert tour of France. Cities performed in include Caen, Chartre,Vernon, Dunkerque and Paris where the symphony played at world famous Notre Dame Cathedral. In 2012 GNOYO, under the direction of Dr. Jean Montes, once again expanded music opportunities. This time the entire GNOYO orchestra had a memorable residency with Grammy Awarding Winning Musician Mark O’Connor at Loyola University. In 2014 The Greater New Orleans Youth Orchestras celebrates a big mile stone in our programs history. This season represents our 20th season of great music education in New Orleans.